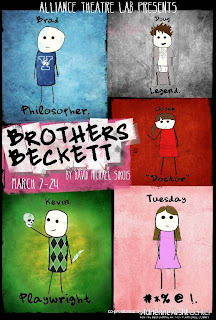 The Alliance Theatre Lab opened its production of Brothers Beckett at the Adrienne Arsht Center for the Performing Arts on March 7, 2013. The company premiered the work at the Main Street Playhouse back in 2011. Kevin Beckett, Yale alumnus, is awaiting the arrival of his beloved girlfriend named Tuesday, who will be spending a perfect week with him and his roommate/brother, Brad. When Kevin divulges to Brad that he plans on proposing, Brad tries to find any way possible to keep his brother from moving out of their bunk-bedded, pink-walled studio apartment. A hilarious and irreverent riff on friendship, family, and adult boys who don't want to grow up, Brothers Beckett is a satirical portrait of slacker siblings laced with sharp banter and dark humor, written by Alliance Theater Lab's own Carbonell Award-nominated resident playwright, David Michael Sirois. Adalberto Acevedo directed a cast that included David Michael Sirois, Gabe Hammad, Mark Della Ventura, Julie Daniels and Ashley Price. Although it seems they've stopped reviewing shows, The Miami New Times published a good advance feature on the piece in February. This production of David Michael Sirois’ serio-comedy feels deeper and richer under the auspices of the Arsht Center’s Theater Up Close program to develop local art. Sirois has said that he only tweaked the script and the changes are nearly invisible. ...far from a retread, this edition has a freshness that might draw fans back to the work and certainly commends it to first-timers seeking a funny, insightful work of theater by, for and about a generation not a decade out of college trying to find its way in a Kelvin cold world. Once again, the production is remarkable for the actors’ chemistry made evident by the unique banter among the four buds. Some of this is Sirois’ skill; Della Ventura showed the same talent last season in his play roomies. But it’s more than what’s on the page. Since Alliance’s rebirth a few years ago, Artstic Director Acevedo has gathered together actors and playwrights who were already friends or became friends, and who have created a working relationship that borders on an artists’ collective. Since the play is tailor-made, the “acting” evaporates instantly. Sirois’ Brad is sardonic and taciturn with that kind of faux pouting that a lover uses to silently prevent their partner from going out with friends. Hammad, one of the newcomers to the cast, slips on Kevin’s persona like the proverbial glove. Affable and earnest, Hammad’s verbal give and take with Brad persuades the audience that these two men have been sparring for two decades. Della Ventura’s Doug is simply an inspired creation: a goofball savant who seems dimwitted about social niceties, but is surprisingly perceptive and empathetic about emotional matters. Price is wonderfully uptight, an upper-crust denizen who is an easy target for Kevin’s taunts, but who is subconsciously mourning the half-realization that Beckett World has no place for her. Daniels is a fetching combination of enough seeming normality to function in the real world, but crippled by her own neuroses. Inside the Arsht’s Carnival Studio Theater – six or seven times the size of Alliance’s digs in Miami Lakes — the set remains a delightful slobby playroom that has never seen a maid or a mother: walls painted in Pepto pink, dominated by a bunk bed with comic book sheets and strewn with revealing detritus thanks to set designer Jodi Dellaventura and prop mistress Anne Chamberlain. 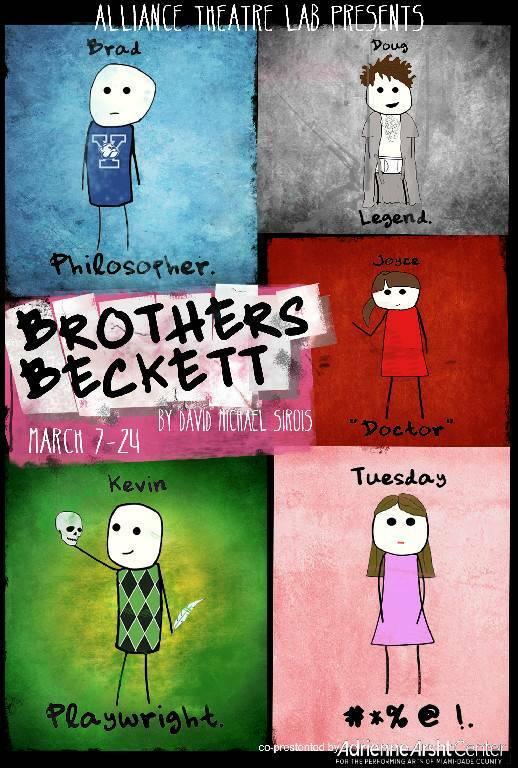 ...Brothers Beckett... got its world premiere in 2011 at the Miami Lakes-based Alliance Theatre Lab. Scott Shiller, executive vice president at Miami’s Adrienne Arsht Center for the Performing Arts, saw that production and thought that Sirois deserved a larger audience for his funny, observant play. So Brothers Beckett has finally made the move from the cozy Main Street Playhouse in Miami Lakes to the Carnival Studio Theater at the Arsht’s Ziff Ballet Opera House. Coproduced by Alliance and the Arsht as part of the Theater Up Close series, Brothers Beckett has had its design scaled larger, three of five roles recast and some work done on the script. Happily, Sirois and director Adalberto J. Acevedo have delivered what Shiller intended: an insightful comedy about just how tough it can be to get going in life. The actors, particularly Sirois and Della Ventura, work together with intricately timed ease. Hammad communicates Kevin’s yearning and greater focus, and he and the often-smirking Sirois are both connected and combative as siblings. Price is a bit less edgy as Tuesday, robbing the Kevin-Tuesday dynamic of some beneficial intensity, while Daniels makes the most of her character’s love affair with hand sanitizer. Della Ventura, whose Doug is a caring friend, a nut case and a recurring sight gag, pretty much gallops off with the show, earning the loudest applause and craziest cheers. Not that anyone, including his impressive pal Sirois, seems to mind. ...it's all so well written, directed and acted that this play, premiering first in Alliance Theatre Lab's small studio in Miami Lakes in 2011, has moved with barely a twitch to the big time of the Carnival Studio space.Adalberto J. Acevedo directed once again and, as is usual with his projects, all is smoothly natural. You have to stand up and cheer for Sirois, not only for his acting, but also for his writing. What could be a door slamming sit com is anything but. It's hilarious, sure, but the quiet moments always ring true. And if you're standing up for Sirois, you'd better be jumping on your chairs for Della Ventura. He's an actor, who, like Sirois, is a master of comic timing. But more than that, once you see him on stage you want to be his best friend. I guess that's called stage presence. A gift from the gods, indeed.